The celebrated science fiction author H.G. Wells also dipped his pen into the genre of historical narrative. His book “The Outline of History,” published in 1920, sold over two million copies and has been translated into multiple languages. Wells said his goal in the massive tome was a “bringing together of of what a contemporary man or woman can know about the past, about self, and about the daily task.” Wells brought both his skillful ability as a wordsmith and his philosophically-nuanced atheistic perspective to full bear on the project. The impact of the Wellsian worldivew is illustrated in the story of a young Jewish father in New York City who required his eight-year-old daughter, an intellectual prodigy, to read the book in its entirety in 1923, resulting in her own conversion to atheism. But the book was not without its challengers. Just two years later, back in Britain, a jolly plum journalist took on the task of countering Wells’ manifesto with the book “The Everlasting Man.” The author was, as you have probably already guessed, none other than the voluminous G.K. Chesterton. The beloved Christian apologist C.S. Lewis read Chesterton’s Everlasting Man as a skeptic in the mid 1920s and later described the book as a major contributor to his trajectory away from atheism and his conversion to theism in 1929. One might conclude this short essay with the words, “and the rest is history” but that would miss how the story comes full circle. In the following years, Lewis would progress from theism into the the thing itself, the gospel of Jesus Christ, driving him onto an international platform for defending the faith. Lewis’s keen mind and clear prose would providentially reach that very same household in the Bronx where Wells’ book had left its mark. The young girl, now a grown woman, was jolted by Lewis’s vivid presentation of the gospel, which led her to begin reading the New Testament, a surprising activity for a Jewish atheist. But even more surprising, she would reject her atheism and, like Lewis years before her, embrace the love of Jesus. H.G. Wells published The Outline of History in 1920, Joy read it and became an atheist in 1923. In response, G.K. Chesterton published The Everlasting Man in 1925 which contributed to C.S. Lewis’s conversion to theism in 1929 and Christianity in 1931. After devouring multiple books and essays by C.S. 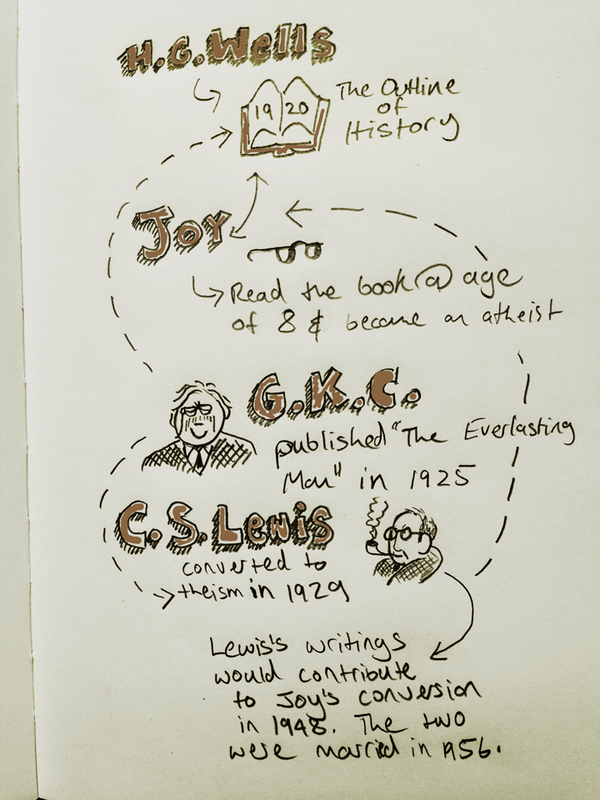 Lewis, Joy began reading the New Testament and converted to Christianity circa 1948. She later moved to Britain and was wed to C.S. Lewis in 1956. And, it seems appropriate now, the rest really is history.